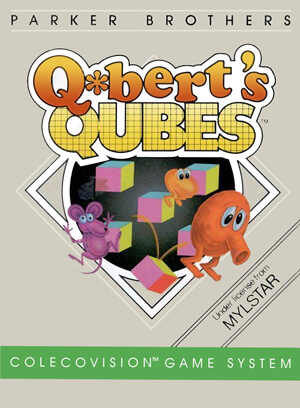 Q*Bert's Qubes is the sequel to the game Q*Bert and features similar gameplay, but is now in three dimensions. Once again your goal is to change multicolored blocks to a target color, but now you must make sure all three visible sides of the blocks match the target color. 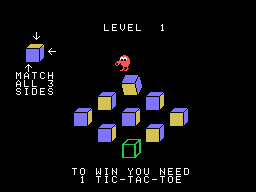 You control Q*Bert on the playfield of blocks; Q*Bert changes the colors by jumping to a block which will cause it to rotate in the direction of his jump. Unlike the original game, you don't need to change the colors of the whole playfield, but rather need to form straight line(s) of the target colors, and when you do you can move on to the next round. Of course, to make this task more challenging are a variety of creatures (including a giant rat!) that chase you around the playfield. Each creature is a different color, and if it lands on a block where the top face is the same color then the creature falls off of the playfield, but if Q*Bert gets caught by a creature then a life is lost! 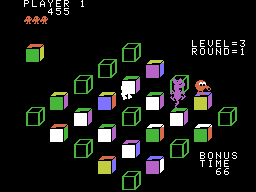 As the game progresses, more creatures chase Q*Bert and additional colors are added to the playfield making it tougher to find the target color. There are no longer any discs on the sides of the playfield to carry you to safety, so make sure you don't jump off the edge! To help out, a green ball may appear from time to time; if you catch this, all the enemies become frozen temporarily.